This Bandana Asheville Tablet Case is perfect for keeping your tablet or iPad safe and secure. 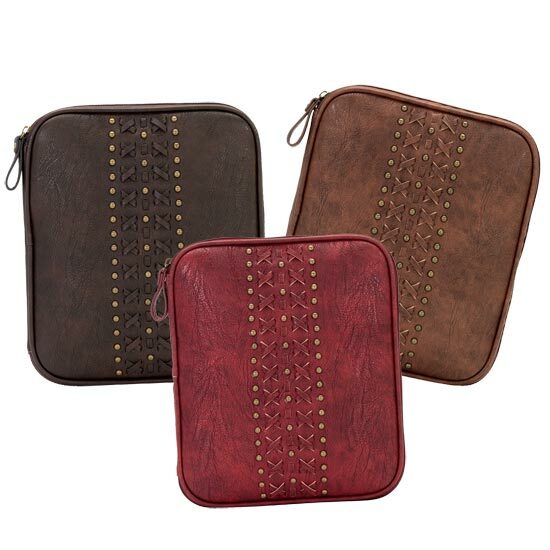 These Bandana tablet cases are available in three colors: Tan, Red, and Dark Brown. The synthetic leather outside is accented with brass studs and lacework. The inside of these western tablet cases features an open pocket to store papers, pencils, and other items. On the right side of the open tablet case are four strips of elastic to hold your device. FINAL SALE: SORRY NO RETURNS, REFUNDS OR EXCHANGES. Size: 8.5" x 10" x 1"